Author(s): Natalia Szkaradek, Department of Bioorganic Chemistry, Chair of Organic Chemistry, Faculty of Pharmacy, Jagiellonian University Medical College, Krakow, Poland. Daniel Sypniewski, Anna M. Waszkielewicz, Agnieszka Gunia-Krzyżak, Anna Galilejczyk, Sabina Gałka, Henryk Marona, Ilona Bednarek. A series of 15 derivatives of xanthone were synthesized and evaluated for the anticancer activity. The structure of the tested compounds was diversified to establish structureactivity relationships. The following evaluations were carried out: cytotoxicity-proliferation tests, apoptosis detection, expression of apoptosis and proliferation-related genes, expression and activity of gelatinases A and B, wound migration assays, and cell adhesion to MatrigelTMcoated plates. Four compounds (7, 12, 13 and 15) displayed direct cytotoxicity at micromolar concentrations toward the studied cell lines. They also significantly affected the expression of proliferationapoptosis markers, and 13 demonstrated as strong influence as α-mangostin, that served as a natural standard in our study. These four compounds also decreased the expression and activity of gelatinases, and inhibited the migration-motility potential of cancer cells. The influence of compounds 7 and 12 on MMPs mRNA levels even exceeded the activity of α-mangostin and shRNA-mediated silencing; zymography revealed that 7, 13 and 15 were as equally active as α-mangostin, despite their higher IC50 values. The highest activity to inhibit motility and migration of cancer cells was demonstrated by 7, 12, 15, and by α-mangostin; and this was almost equal to shRNA-mediated silencing. Structural features predetermining compound activity were: substitution at position C4 instead of C2, and presence of a chlorine atom and allyl moiety. 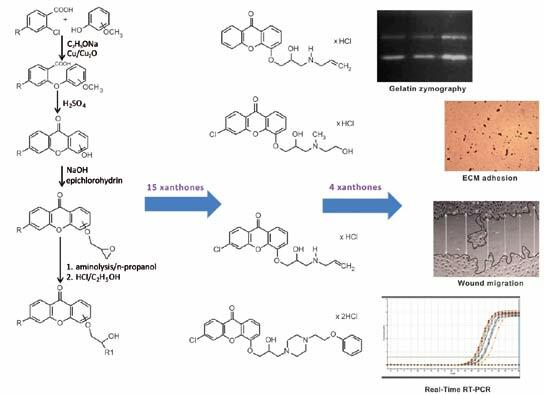 These results indicate that synthesis of aminoalkanol derivatives of xanthone may lead to successful establishment of new potential anticancer chemicals. Keywords: Xanthones, xanthone derivatives, cancer, cell proliferation, cell migration, metastasis. Affiliation:Department of Bioorganic Chemistry, Chair of Organic Chemistry, Faculty of Pharmacy, Jagiellonian University Medical College, Krakow, Poland. Keywords:Xanthones, xanthone derivatives, cancer, cell proliferation, cell migration, metastasis. Abstract:A series of 15 derivatives of xanthone were synthesized and evaluated for the anticancer activity. The structure of the tested compounds was diversified to establish structureactivity relationships. The following evaluations were carried out: cytotoxicity-proliferation tests, apoptosis detection, expression of apoptosis and proliferation-related genes, expression and activity of gelatinases A and B, wound migration assays, and cell adhesion to MatrigelTMcoated plates.